My Lebanese Fattoush Tuna Salad Recipe is based on traditional Lebanese Fattoush Salad. It is healthy and tasty and the best tuna salad I have ever made. 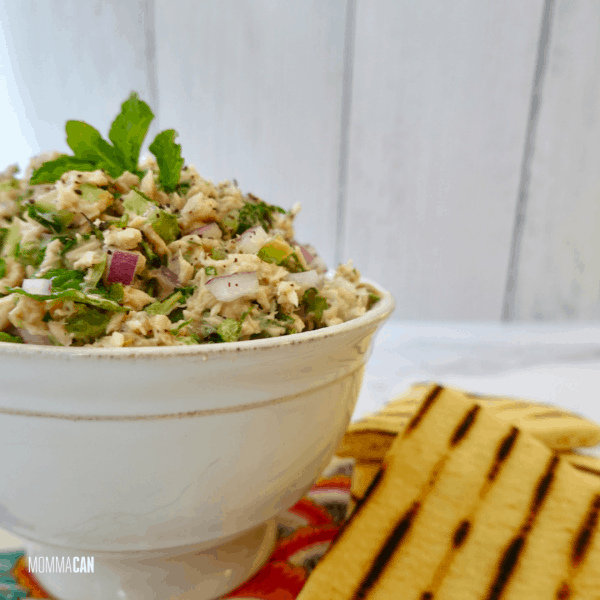 Lebanese Fattoush Tuna Salad is based on the authentic version of Fattoush Salad I have tried from several Lebanese home cooks and restaurant owners. 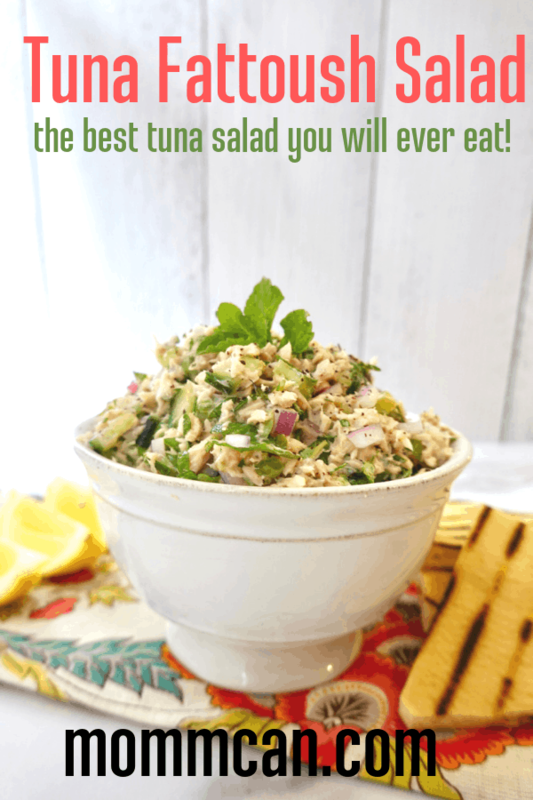 It is quite honestly the tastiest and most refreshing tuna salad recipe I have eaten. I mean seriously; it reminds me of my Aunt Ruby and eating peas. Aunt Ruby wanted her beau to think she ate like a petite woman of 90 pounds. 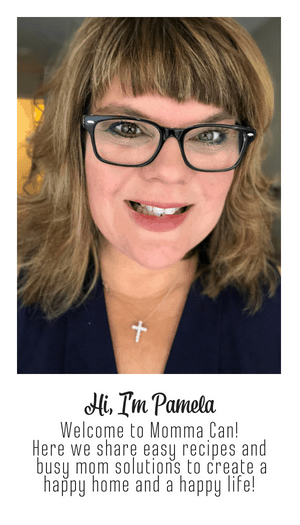 It mattered not that she was nearly 6 foot tall and could handle a herd of cattle and worked in accounting at a time when it was truly “not a woman‘s place to work”. She invited her beau for supper to meet her parents. They had the typical southern fare for special company, fried chicken, mashed potatoes, cornbread, and a big pot of peas. (you would know them as green peas). She spent half the supper-time slicing her peas in half with a fork and knife as if it were going to impress her guy. The thing was she was darn hungry after the meal. She jumped up to clear the table. The dining room and the kitchen were separate rooms, which helped with the heat in the old days. Otherwise, you melt away at the dining table in the summer. So Ruby was safely tucked away in the kitchen with the door closed. Her daddy went to check on her because she had been gone a long while. Ruby was standing over the peas pot and eating them by the spoonful. Her daddy got chuckled and shared the story to anyone who would listen, even on the day Ruby finally married her beau. To this day, the story of Ruby and the Peas Pot lives on. And with that backstory… this is how much I love my Lebanese Fattoush Tuna Salad Recipe. I love this tuna recipe like Aunt Ruby loved peas. Fattoush is a Lebanese peasant salad made with toasted or fried bread and fresh chopped vegetables including cucumbers and radishes. It is a salad often served with families meals and you will probably see a freshly made hummus as well. Fresh herbs are really what drew me to the Fattoush salad, especially mint. Often Sumac is used in the dressing and as a hint of garnish. However, lemon juice and lemon rind combined with olive oil makes a wonderful dressing as well. Sumac is often used when lemons are not in season. This makes Fattoush so wonderful because the salad is made with seasonal vegetables. There are several methods used for the bread in Fattoush salad, frying, baking, even toasting in a pinch. For our tuna salad recipe, I use olive oil and baked until golden brown at 350 degrees. My son loves the pita bread cooked this way, so much that I always make plenty extra and add to snack bags for his lunches. Toasted pita at home is much better than buying store bought pita chips. These can be quite hard and not truly palatable for salad. For the tuna salad, I cut the bread first into longer bite-sized pieces, this works perfectly for our fattoush tuna. Like traditional Fattoush this is a salad made from fresh vegetables and delicious toasted Arabic bread. 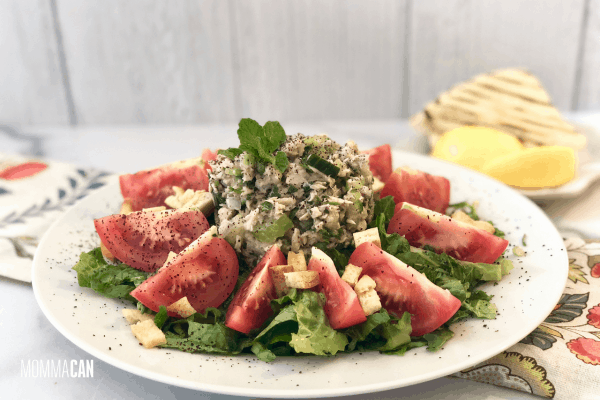 Fattoush Tuna Salad is a change from traditional tuna salad. It is budget-friendly and healthy. The fresh mint and parsley are a real treat in the salad. Good olive oil and the citrus tang of fresh lemon make the best dressing for this salad. Mayo would fight the flavors of the vegetables and herbs. 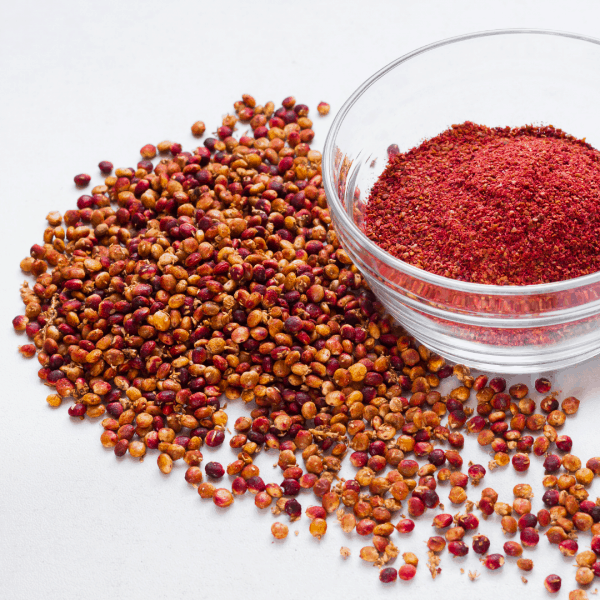 Ground sumac is a versatile spice with a tangy lemony flavor and less tart than lemon juice. A small sprinkle also adds a beautiful pop of color to any dish. It can actually replace the lemon in the tuna salad dressing. Fattoush Tuna Salad is wonderful over chopped Romaine lettuce or mixed salad greens. Add tomato wedges, sliced cucumbers, radish slices, or whatever vegetable is fresh and local to your community. Even fresh fruit is yummy with the salad. Add some grilled pita bread for a more filling dinner. If you are having this a wonderful addition is a meal scoop of homemade hummus. Homemade or from a very good restaurant are your best choices. I find that grocery stores rarely carry quality hummus. But if you are busy, find a grocery hummus is chemical free and uses real olive oil and other real ingredients. Lebanese Fattoush Tuna Salad Is Yummy! 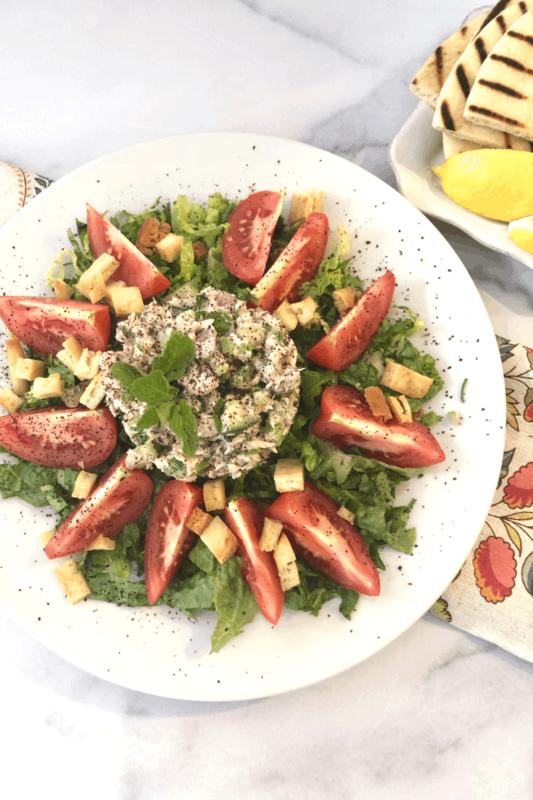 My Lebanese Fattoush Tuna Salad Recipe is based on traditional Lebanese Fattoush Salad. It is healthy and tasty and the best tuna salad I have ever made. 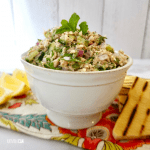 The tuna with the fresh mint and parsley, freshly chopped vegetables, lemon, olive oil, and toasted pita really make this salad a go to in my kitchen recipe collection. Enjoy!